Billy planned the entire day start to finish. And he really did manage to surprise me. I didn’t notice him act differently at all that day, and there were so many times I unknowingly almost ruined his plans. He told me we were going to meet his sister in Asbury Park for happy hour at Anchors Bend beach bar. It was August and a beautiful day, as a teacher I love to spend all of my time outdoors in the summer, so the beach bar was the perfect spot. When, about halfway through my first drink, he told me we had to go meet friends at Ale House, I was pretty bratty and decided I wasn’t going because it was beautiful on the beach, and summer was almost over, and he was rushing me through my cocktail (priorities). His sister saved the day and said why don’t we walk by the water while the sun sets and we can enjoy finishing our drinks. Not only did she make my bratty self happy with that, but she also set Billy up for the ultimate proposal location. As soon as we got to the waters edge Billy got down on one knee, and his sister had already pulled out her camera to capture some great photos of the moment. We then went to Ale House to meet our “two friends” but when we walked in, Billy had a small area reserved with our families and best friends waiting to celebrate with us. Billy helped A LOT with planning and that made the experience pleasant, easier, and less stressful. He was on board with my picks for our color scheme and details- white flowers, dark greenery, the girls in dark gray, and gold accents. He was really excited to pick out the shoes for the groomsmen, which were custom black leather nike high tops with suede checks and each groomsman’s initials in dark gray on the back. One of my favorite details to pick was the invitation, I owe it to Evelyn at the Papery in Shrewsbury for spending hours with me designing it. We pulled fonts, paper, shapes, colors, and monograms from different books of the William Arthur (Crane) designs to make it my very own. I loved it so much I ended up putting our monogram on EVERYTHING, including our dance floor. Two of my other favorite details were the signs my cousin, and maid of honor’s sister hand made for us. Which were our welcome sign, and signature drinks sign. Both were made on antique frames. The welcome sign was hand painted on a canvas inside the antique frame, and the signature drinks my cousin wrote on a mirror inside the antique frame. Last, but not least, we knew food to go was a must as we usually leave weddings looking for a midnight snack, so we had a mini slider and French fry station set up for when guests left! We met through a mutual friend at a party one night at Rutgers (how romantic) everyone thinks that I went to Rutgers but that’s not the case, I went to Montclair, I tell everyone I got my “weekend degree” at Rutgers because I was there with my friends almost every weekend. Billy played it cool, even though I noticed him the second my friends and I got to the party, (but he’ll tell you he noticed me first) until we got to the bar Scarlet Pub (again how romantic) and then he finally approached me to join him for a drink and that sealed the deal. 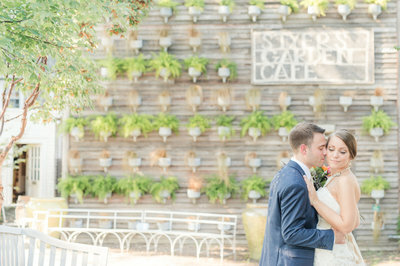 We actually had gone to about 13 venues before we visited Florentine Gardens, (yes, Billy has the patience of a saint) none of the other venues were the perfect fit, we both kept finding reasons not to book the others. 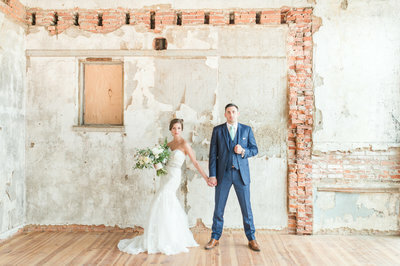 When we got to Florentine Gardens, we still had other venues lined up to look at (believe it or not) but when we walked into the ballroom we looked at each other and we were both like “this is it.” I knew I wanted an open, large ballroom with chandeliers, a lot of windows, and a fireplace. Their ballroom had everything on my checklist, and I finally realized that I liked the “estate” feel as well. The fact that they only host one wedding at a time, and the way their staff was so welcoming and made us feel comfortable from the very first visit just gave us the confirmation that we knew we had to book. My favorite moment was when Billy and I were allowed to enter our ballroom alone before all of our guests and look at everything that we worked so hard to plan and put together. Our DJ (Jason Jani) played our first dance song in the background while we got to walk around and take it all in. Susan and our videographer Jonathan were right there with us too to capture the private moment. It was a feeling I’ll never forget. Billy says his favorite moment was the entire day, he can’t pick just one, he continually repeats how it was the best day of his life, and how he wouldn’t have changed a thing, that all of our vendors and bridal party were amazing and made it all go so smoothly and perfectly. We are going to Hawaii on our honeymoon in July! We are going to Maui and the big island and have a lot planned to explore, and a lot of relaxing to do too! 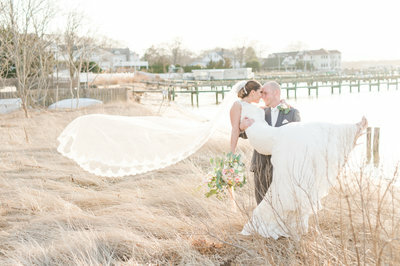 Love this Estate at Florentine wedding? PIN the image below or any of the pictures in this post!